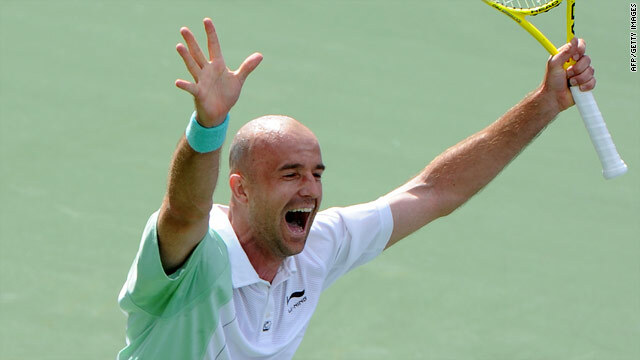 Ivan Ljubicic celebrates after claiming his second big scalp of the ATP Tour's Masters tournament in California. (CNN) -- Defending champion Rafael Nadal crashed to a shock defeat by Ivan Ljubicic in the semifinals of the Indian Wells Masters tournament in California on Saturday. The unfancied Croatian 20th seed came from behind to beat the former world No. 1 3-6 6-4 7-6 (7-1) in the outdoor hardcourt event, which the Spaniard also won in 2007. The 31-year-old beat third seed Nadal for the second time in seven meetings, with his other victory back in 2005. Ljubicic, who reached a career-high third in the world rankings in 2006, will face American seventh seed Andy Roddick in Sunday's final. Roddick defeated Swedish sixth seed Robin Soderling 6-4 3-6 6-3 in a showdown between two big servers in the later semifinal to earn his first shot at the Indian Wells title. Now ranked 26th, Ljubicic followed up his surprise win over world No. 2 Novak Djokovic in the fourth round to reach his first ATP Tour final since winning the Lyon tournament in October. The result ended Nadal's strong return to form in his first tournament since retiring hurt in his Australian Open quarterfinal against Andy Murray in January.